Shall i call the "AA" sir? "Poundland? Its a bit further down the high street, sir"
"I'm afraid you'll have to wait another 15 years before being done for 'kerb crawling' around here, Sir!" Interestingly the registration comes up with a red Ford 1098cc vehicle that has been off the road since 1990. "Yes sir, the scrap yard is next left at the lights, you should get a tenner for it............."
"My Dad had one of these"
"My Grandad had one of these"
"My Uncle had one of these"
Ahhhh, yes sir, the Datsun dealership, straight through the lights, half a mile on the left, you can’t miss it. "think its funny do you sir, driving around in a better car than ours?" 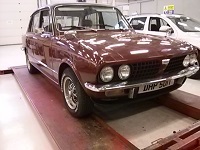 DVLA have it as a Brown Triumph, 1854cc registered Oct 76, last taxed may 1986.